It is absolutely blowing a gale here at the moment! The wind blew most of the night so the temperature remained high. I slept quite well last night but Neil said that he had trouble sleeping, apparently there were some late night arrivers who decided to become serenaders and kept poor Neil awake. They played their guitar and a little singing and Neil said it was quite nice music!﻿ I must admit I do remember waking up and hearing music and then falling back asleep. We do know that there is a festival on at Warracknabeal this week for busking and they have quite a few contestants so maybe that is where they are heading. I did see them yesterday in the distance but it was too hazy to take a photo ... it was a little clearer this morning. 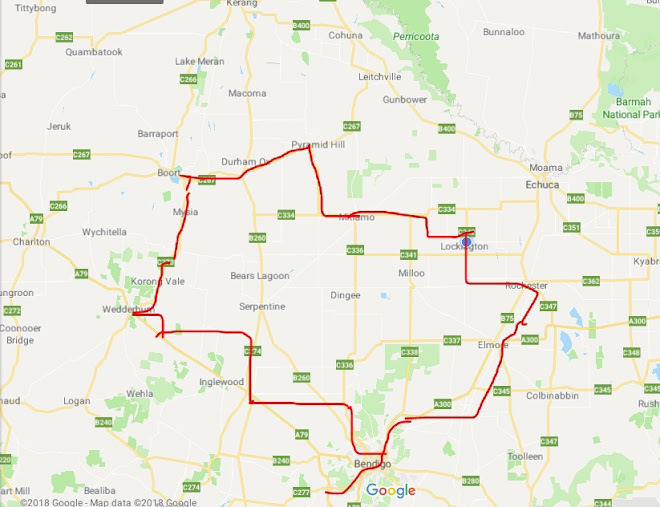 After picking up some expensive food at the local IGA we headed straight north and into a very strong headwind - around 30km plus per hour so the going was very slow. 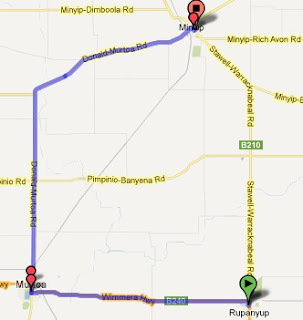 After about 12km the road swings to a north east direction and it is at this point there is an intersection where a road diverts to Warracknabeal. Now we are coming up to this intersection and we have right of way but there is a car turning right into the road going to Warracknabeal and she decides that she doesn't want to wait for us as we cross the big intersection at a misely 10km per hour so she cuts in first which is fine with us as she doesn't interfere with us and is on the other side of the road as she enters the Warracknabeal road but she wasn't paying attention when she got to the intersection and was too busy watching us that she neglected to see the person in a card coming from Warracknabeal and entering behind us! We didn't hear a beep and honking of the horns due to the strong winds making too much noise in our ears. But we assumed that the car coming from Warracknabeal had seen what she was going to do and stopped - Neil said they did stop for the woman as he was a little further back. Anyway the going is getting really tough so we plow on and the road keeps swinging east so the wind moves from infront to the side and is now blowing us out onto the road - fortunately it wasn't a busy road, the road keeps turning east and eventually the wind is almost behind us so we are able to pick up the pace a bit. as you can see not the greatest but good enough for us and cheap with power at $10 per night. We think we will be the only ones here tonight. Now let me tell you something about Minyip ... but first I forgot to remind you last night that Rupanyup is famous as this is the place they filmed the Australian series 'flying doctors' now last time we came through Rupanyup and I found out about this I was gutted as I genuinely believed they did it all in the outback out at Broken Hill. Well do you remember in the series the town of Coopers Crossing? well that is this place ... Minyip (why they changed the name I don't know!) I am still a little disappointed in the series now (I know I need to 'get over it' but I can't!) as I remember watching it and think yup I would like to go to that place Broken Hill, and really it is virtually just a suburb out of Melbourne! .... okay a slight exaggeration there. But really the Royal Flying Doctor service isn't even in this area as it is too close to big hospitals and quicker by car! When we got here Neil felt like some icecream so we got a 2 litre tub of vanilla and it was yummy so I am not sure if we need to have a big dinner. Tomorrow we are going north west to Warracknabeal and then onto Brim which has a camp spot a bit like this.